The University of East London gave five students from the school the opportunity to pay off almost a full year of tuition by winning a competition organised by Scott-WhitbyStudio and Sir Robert McAlpine. They were given the task of reimagining the building welfare for over 400 site operatives on British Land and GIC’s Broadgate campus near Liverpool Street - the first live project to be completed in the redevelopment of Broadgate. The final proposals were then constructed on site. A vast amount of material with short lifetimes is used for office interiors. With this in mind, the team proposed saving existing materials, destined for landfill from a building scheduled for demolition, giving these materials a second life in a space where site operatives would work, eat, change and shower. The students were given only two weeks to catalogue and salvage material being taken out of Peter Foggo’s 1 Finsbury Avenue, which was in the midst of a significant strip out. One of the designs involved transforming discarded fire doors, of which there were nearly 300, into a door-wall, standing 3.8m tall, which could be constructed in 1.8m segments. 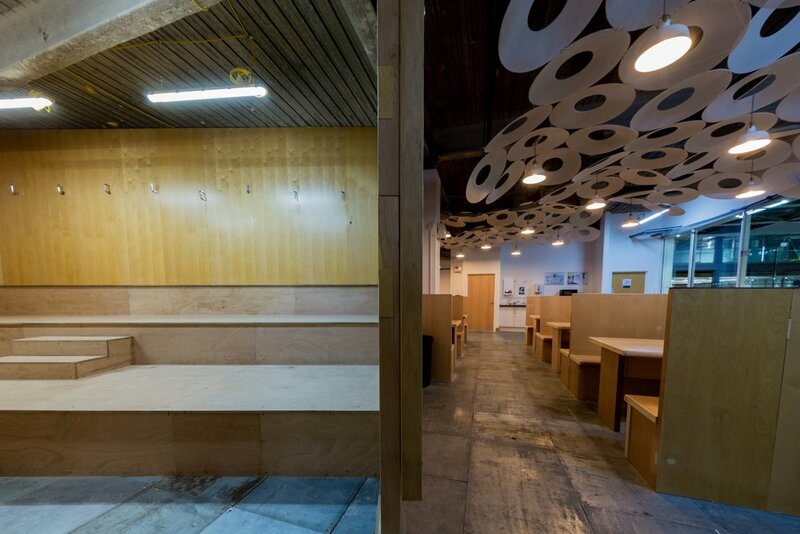 The off-cuts created a patchwork design which not only bolted the wall together but also created a feeling of warmth and intrigue in the welfare centre, a space that usually ends up overlooked in site planning. The intentions of the project were to shine a light on, respect and celebrate the workers that build the cities we live in. Tutors: Jeff Tidmarsh, Ed Tidmarsh, Alex Scott-Whitby, Osman Marfo-Gyasi.